“The Dismal Circle” album out now!! We are proud to announce the release of our 4th full-length album “The Dismal Circle” today! The album features 6 tracks at a total of 62 minutes of hate-ridden Death/Doom Metal and is released on FDA Records as CD (jewelcase), 2-LP (gatefold), 2-LP limited edition (clear yellow smokey), download and stream. Available at every well-sorted record retailer, at FDA Records and of course here in our webshop. “Among the absolute TOP records of the year. Sit down, listen and slide down into the deepest abysses of your soul”. 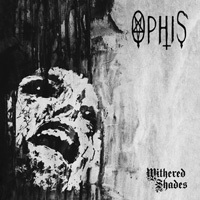 “Withered Shades” CD back in stock!! Although the CD version of our second album “Withered Shades” has been out of print for 2 years now, we managed to get a final stock of rest copies!! Available now as long as it lasts for only 10,00 € special sale!!! Remember: getting this second hand on eBay will cost you a lot more! 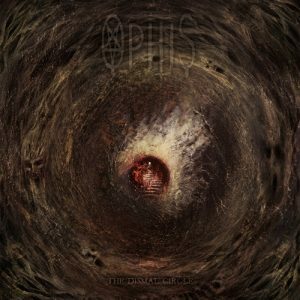 We finally built a new webshop, where you can purchase Ophis records and merch from the band directly. Of course even cheaper than your mommy. Just click “shop” and take a look. You can also pre-order our upcoming album “The Dismal Circle”. We will add NEW T-SHIRTS SOON! please note that orders from outside Europe can only be paid via PayPal! Sorry for that. 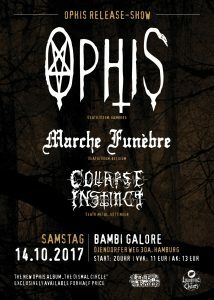 We are playing a release-party gig in our hometown Hamburg, at our beloved fave-venue, the “Bambi Galore” on october 14th. We will have the new album for sale at reduced price at that show exclusively.